Praise rains in from across the political spectrum after security forces capture murderers of Rabbi Raziel Shevach. Prime Minister Netanyahu, President Rivlin, and Knesset members praised the IDF after Thursday's operation in Jenin in which the terrorists responsible for gunning down Rabbi Raziel Shevach last week were captured. One terrorist was arrested oat a Jenin gas station and another was killed during a shootout with security forces. A third terrorist was arrested after troops started bulldozing his house. President Reuven Rivlin, who had monitored the operation in real time, said this morning that he is "proud and appreciative of the best of us, who are engaged in an unrelenting pursuit after Rabbi Raziel Shevach's murderers." "We thank them and all the security forces who are taking part in this important operation with courage and heroism, and we pray for the wounded." Defense Minister Avigdor Liberman concurred, writing that "the security forces carried out a complex and successful operation tonight to capture the murderers of Rabbi Raziel Shevach, and I congratulate the Yamam unit for their courage and wish the wounded a speedy recovery. The terrorists have no place to hide- we will get them wherever they are." The head of the opposition, MK Isaac Herzog, also thanked the Yamam operatives. "Thank you to the combat soldiers, the IDF and the security forces for a successful operation," he said. "The reality on the ground is tense and the struggle against terrorism is not over." The Yamam had arrested the first terrorist at a Jenin gas station and hauled him in for questioning. The second terrorist was spotted nearby and was killed after a heavy shootout. 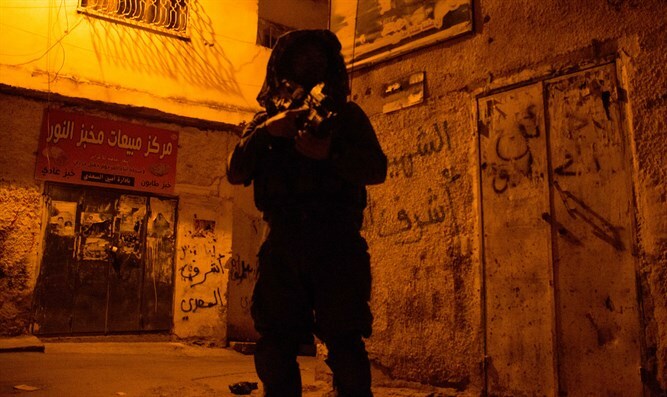 A gun battle also erupted with a terrorist hiding in a Jenin house. The Yamam encircled the house and began demolishing it with the help of troops from the engineering unit. In the end, the terrorist was arrested. During the shootout, two Border Police officers were wounded. One of them is in serious condition and the other is in light condition.